FILM SCREENING Face of a Nation: What happened to the World's Fair? Please join us for a special screening of Mina Chow's documentary film, Face of a Nation: What happened to the World's Fair. Mina will introduce the film and host a Q & A afterwards. For generations of Americans, World’s Fairs captured visions of hope for the future as part of their collective memory. Mina Chow became fascinated with them when she saw pictures of her parents at the 1964 New York World’s Fair. Mina had great expectations when she attended the 2010 Expo in Shanghai, however, the U.S. pavilion was very dismal and her expectations were crushed especially when compared to the brilliant representations of other countries. Her film explores the reasons and the importance of cultural diplomacy through architecture and public policy. 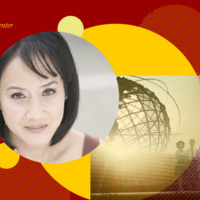 Mina Chow is interdisciplinary faculty, a licensed architect and filmmaker who teaches 1st year building science studio and professional practice at USC.